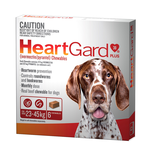 Heartguard is a well-established brand that vets and dog owners have trusted for years. 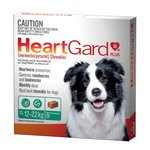 Heartguard is a monthly chew that protects your dog against heartworm, hookworm, and roundworm. Is my dog at risk of heartworm? Heartworm is spread by mosquitoes and is still prevalent in certain areas of Australia. Mosquitoes transmit heartworm larvae, which travel through your dog's blood stream and settle as an adult in the chambers of the heart. Heart failure ensues, and can cause issues such as exhaustion, lack of oxygen, collapse, and death. Treatment of heartworm is extremely dangerous and difficult, but prevention is extremely easy thanks to products like Heartguard. 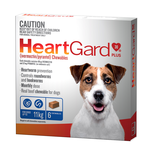 Heartguard comes in a tasty chew form, which is highly palatable. Dogs love it, and will think they are just getting chewy treat once a month.